Last month, I had the pleasure of sitting down in the middle of a fragrant peach orchard and experiencing what will be one of the most memorable dining experiences of my life. 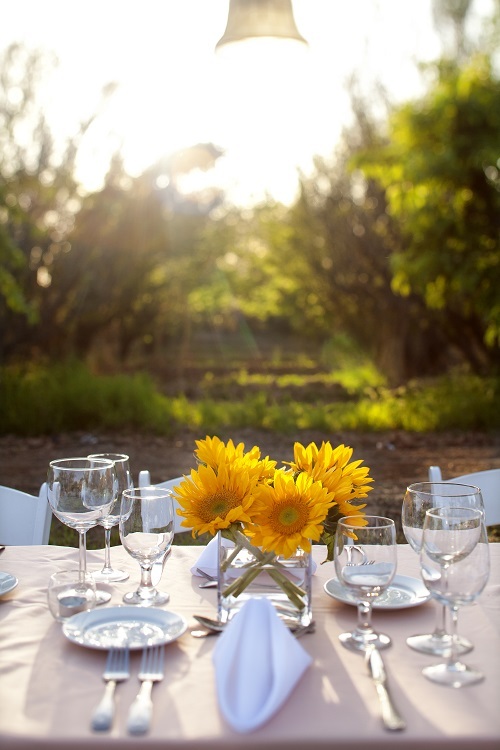 Called Dinner Down the Orchard and hosted by Schnepf Farms, this community gathering event is hosted only a handful of times a year and brings together visitors and locals from across the country. The evening started just before sunset in the garden of the Schnepf family homestead, and we were greeted by local farmer Mark Schnepf who shared with us his efforts to preserve the heritage of family farming in Queen Creek, Arizona. It was in this idyllic setting that we were served glasses of bubbly wine, warm flatbreads featuring freshly-picked items from the farm and greeted by Carrie Schnepf as she escorted us to the beautifully-appointed table set for 80 guests. As the sun set, the evening filled with conversation, course after course of delectable cuisine, and new connections were being made. Schnepf Farms is a fourth generation family farm and the largest organic peach grower in the Arizona. Throughout the year, they open their family farm to the public for festivals and events - (save the date...peaches are ripe for the picking in May!) - and the Dinner Down the Orchard series features notable Valley chefs and showcases the culinary bounty of the season. My dinner was elegantly prepared by Chef Vincent Guerithault of Phoenix. His family helped serve us and after our dessert course of homemade peach pie (from Carrie herself! ), we were introduced to Chef Vincent and his family. This warm evening was made even warmer when you saw the many familial connections that are held so dear and shared with all. You, too, can enjoy this experience. This evening will promise enchantment at every turn and feature the culinary stylings of Chef Eddie Matney. Book your seat at the table today at www.schnepffarms.com.